Typically caramel is full of butter leaving vegans and those with milk allergies in the cold. 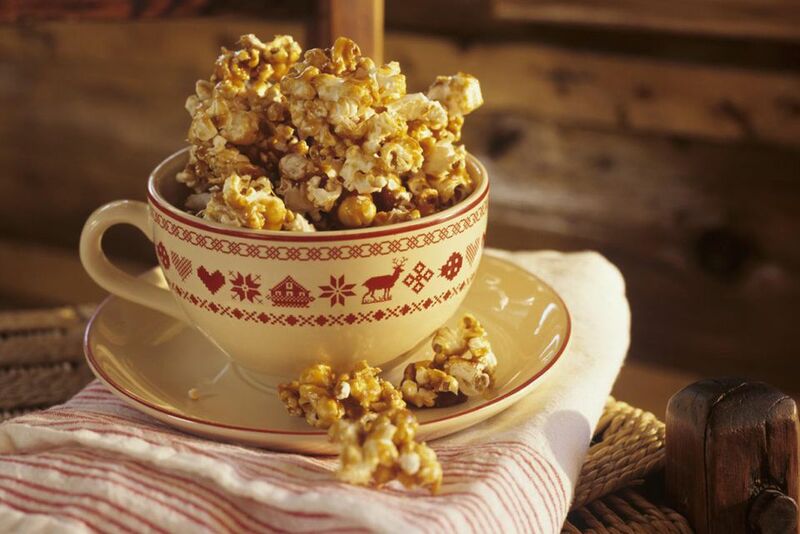 But this dairy-free vegan caramel popcorn recipe is a cinch to make. It's terrific for little gift bags for parties and the holidays as treats for kids and adults alike as well. For a special vegan dessert, after you've tossed the popcorn with the caramel, add in some chocolate chunks and nuts of your choice! Best kept in a plastic bag after completely cooling, this popcorn can last up to 2 weeks if properly stored. Before beginning, set aside a large baking sheet lined with wax paper. Prepare the popcorn. In a 4- or 5-quart stock pot with a lid, combine the oil, margarine and popcorn kernels over high heat, frequently shaking the pot back and forth to heat the kernels as evenly as possible. Once the first kernel has popped, place the lid on the pot and continue to shake the pot to keep the kernels from burning. Once the kernels have filled the pot, transfer the popped popcorn to a large bowl and toss with the salt. Set aside. Make the caramel. In a large saucepan over medium-high heat, combine the sugars, corn syrup and water, mixing well until the sugar is dissolved. After sugar is dissolved, let the mixture boil, unstirred, until light amber in color, about 8 to 10 minutes, washing down the sides of the pot with a wet pastry brush from time to time to prevent crystals from forming. Turn off the heat and add the dairy-free soy margarine and vanilla, carefully stirring to distribute the margarine. Remove the pan from heat and sprinkle the baking soda over the mixture, stirring to distribute. Immediately pour the caramel sauce over the popcorn, stirring quickly to distribute. Spread the popcorn onto the prepared sheet and allow to cool completely before serving. Popcorn will keep for 2 weeks in a dry, airtight container at room temperature.